The Venona Project was the United States Army's Signal Intelligence Service, and later the National Security Agency, operation to intercept and decrypt high-level Soviet diplomatic communications. The project formally began during World War II, though Soviet communications had been monitored occasionally since World War I. The longrunning Venona Project spanned the length of the Cold War, ending in 1980 at the beginning of the period of détente preceding the fall of the Soviet Union. Venona decrypts lead to the arrest of several Soviet NKVD, later KGB, agents operating in the United States, and gave U.S. intelligence information regarding Soviet infiltration of sensitive government departments and classified projects. Key breakthroughs. The U.S. Army's Signal Intelligence Service formally began the top-secret Venona Project on February 1, 1943. A team of cryptologists established project headquarters in the building of a former girls' school in Arlington, Virginia. The location became known as Arlington Hall. The Venona team began the difficult task of deciphering Soviet diplomatic intercepts gathered by U.S. intelligence since 1939. The collection was unsorted, unanalyzed, and in disarray, but the small Arlington Hall team quickly made key breakthroughs that allowed limited interpretation of the Soviet communications. After sorting the intercepts by cipher system, origin, and recipient, cryptologists discovered that certain ciphers were used for certain missions. Diplomatic intercepts were different from Soviet intelligence communications, but many of the codes were variations of each other. In all, the initial team identified five separate cryptological systems. Several key breakthroughs in the Venona Project facilitated the monitoring of Soviet communications by the U.S. intelligence community. Cryptographer Cecil Phillips observed mathematical patterns in one of the Soviet cryptosystems. While the full decoding of these messages remained illusive, the Arlington Hall team was able to identify intercepts from KGB communications. In October 1943, an archaeologist working as a wartime code breaker, Richard Hallock, discovered repetitions and patterns within other Soviet codes. This breakthrough lead to the first partial decoding of Venona intercepts. A decoded 1945 message suggesting worry about a soviet defector codenamed "Gnat" (Viktor Andreevich Kravchenko), one of thousands of secret KGB and GRU messages intercepted and decoded by the U.S. Signals Intelligence Unit, which was codenamed VENONA. read with some success, but the process of translating and analyzing the decrypted messages was painstakingly slow. Venona intelligence. The first successful uses of intelligence information gathered by the Venona Project came in 1945. Though Venona intercepts could only be deciphered in part, and yielded scant information, two events verified their accuracy and uncompromised nature. As Cold War and anti-communist tensions rose in the United States, the FBI investigated the claims of several people who professed to have knowledge of Soviet espionage activities. Agents questioned Whittaker Chambers, who, as early as the 1930s, reported details of suspected Soviet espionage within the U.S. government. His claims had gone unnoticed in the previous decade, but Whittaker provided information on Soviet agents consistent with similar information in Venona intercepts. Later the same year, Elizabeth Bentley, a minor KGB agent and courier, provided FBI agents with a list of Soviet spies operating in the United States, and their codenames. Some of the codenames Bentley provided matched names that frequently appeared in Venona project messages. U.S. intelligence was thus assured that Soviet intelligence had no knowledge of the Venona Project, or the degree to which the security of Soviet diplomatic and intelligence communications had been compromised. The following year, analyst Meredith Gardner decoded several portions of KGB messages, furthering decryption efforts begun on the cipher system by Cecil Phillips. The Venona team concentrated on decoding intelligence communications between Moscow and a KGB stronghold in New York City. Gardner decoded messages relayed two years earlier in 1944. In the wartime communications, Soviet officials discussed plans for foreign espionage, counterintelligence measures, and high-level secret American projects. Among the secrets passed between the New York KGB Residence and Moscow headquarters were communications regarding U.S. weapons development. Venona intercepts analyzed by Gardner revealed that Soviet intelligence gained top-secret information on the Manhattan Project, the United State's effort to develop the atomic bomb. Arlington Hall provided U.S. intelligence with evidence of an extensive Soviet espionage campaign within the United States. Venona intercepts also yielded information about Soviet intelligence efforts in Latin America and Western Europe. As Venona intercepts yielded more information about Soviet infiltration of other Allied governments, United States officials shared the intelligence with Britain and France. In 1948, British cryptologists joined the Venona team. The Venona project monitored Soviet communications in the United States and Britain, ferreting out undercover Soviet intelligence agents in both governments. United States Venona intelligence was sent to the FBI and CIA, while MI-5 and MI-6 processed information from the British team. Breaking the Soviet espionage network in the United States. Information from Venona intercepts led to the arrest of several Soviet spies in the United States. Since Venona documents were not analyzed as they were received, however, most of those identified foreign agents had given secrets to the Soviets during World War II. Though the Soviet Union was a military ally of the United States during the war, sharing secret information remained illegal. Immediately following the war, relations between the two counties deteriorated. Thus most of the Venona intercepts were translated and analyzed in the light of Cold War tensions. Among the Soviet agents first identified by Venona communications were State Department officers Alger Hiss and Laurence Duggan who gave the Soviets wartime intelligence. Lauchlin Currie, a friend and aide to President Franklin D. Roosevelt, notified Soviet intelligence when agents operating in the United States were dubbed suspicious by U.S. intelligence and law enforcement. Duncan Lee, an assistant to OSS Chief William Donovan, divulged a plethora of intelligence secrets to Moscow. Three members of the Treasury Department sold the Soviets weapons designs, economic assessments, and other classified information. An NSA linguist, William Weisband, who briefly contributed to Venona by translating intercepts, notified Soviet intelligence of the project's existence. After this early wave of arrests in the 1950s, several more agents were discovered and taken into custody in the following decades. However, the most notorious, and perhaps the most threatening to national security, of the agents identified by Venona intercepts was the network of Soviet atomic spies. Venona intercepts proved that Soviet agents had infiltrated most areas of the Manhattan Project, and had obtained secrets from ultra-secure sites such as the Oak Ridge and Los Alamos. In 1947, Gardner discovered that the Soviets had placed several intelligence sources in the War Department. While Gardner uncovered several dozen codenames in communications regarding atomic secrets, Venona intercepts added to the cases against spies Klaus Fuchs, Theodore Hall, and Julius Rosenberg. The team first cracked Rosenberg's codenames, Liberal and Antenna, because of a carelessly coded intercept that used both of his cryptonym and also discussed his wife, Ethel, using her real name. The trial of Julius and Ethel Rosenberg drew a mixed public reaction. Federal prosecutors relied on other evidence, most of which was not as compelling, to convict most Soviet informants rather than expose Venona to the public. Historians and journalists who later investigated anomalies in the Rosenberg case similarly did not have access to Venona documents. Several cases, including that of the Rosenbergs, remained contentious within the general public until Venona documents began to be declassified in the mid-1990s. Venona intercepts not only provided American and British intelligence with the identities of Soviet spies, they also provided information regarding Soviet intelligence tradecraft. Through Venona communications, the U.S. intelligence community learned how the Soviet network functioned. Venona documents illustrate how agents were recruited. The messages detailed the use of dead letter drops and the process for arranging meetings between agents. Venona intercepts provided information on Soviet counterintelligence operations and efforts to locate defectors in the United States. The legacy of Venona. During the course of the Venona Project, nearly 2,200 messages were intercepted, decoded, and translated. Though the project officially spanned decades, its greatest successes were in the first decade of the Cold War. The Arlington Hall team decoded most KGB messages intercepted between 1947 and 1952. Soviet diplomatic messages, which used a less complicated cipher and encryption system, were routinely broken until the Soviets changed the cipher in 1957. Messages were often reworked by intelligence personnel, especially when trying to crack recurring codenames. While the Venona Project was largely a success for the United States, it did have limitations. Messages were difficult to decipher, and the project did not decode messages in real time. In the earliest years of the project, code breakers worked on intercepts that were two and three years old. The process was accelerated in 1953 when Venona code breakers received from U.S. military intelligence the remains of a partially charred Soviet codebook. The book aided cryptographers in breaking the overlaying encryption system of several codes. The Venona project was so secretive that intelligence officials did not brief President Harry Truman on its existence for several years. Regardless of its secrecy in the United States, Soviet intelligence learned of the operation and conducted counterintelligence against the Venona Project. KGB defectors, agents who fled the Soviet Union for the United States and cooperated with U.S. officials, told U.S. intelligence that KGB headquarters had limited knowledge of the communications surveillance program. Soviet officials placed their confidence in their encryption systems and did not order an immediate change of codes to protect communications security. Soviet double agent and master spy Kim Philby visited Arlington Hall for briefings while stationed in Washington, D.C. between 1949 and 1951. Whether Philby provided KGB headquarters with a detailed report of Venona operations remains unknown, but again, the Soviets did not quickly change their cipher systems. One of the most contentious assertions of Venona intelligence is the involvement of American political organizations, especially the American Communist Party, in Soviet-led espionage against U.S. interests. Venona intelligence was used to seek out Soviet agents of espionage, but some charge that the project conducted surveillance on citizens and contributed to McCarthy era anti-communist hysteria among government officials. Recently declassified Venona documents show real links between a few radical socialist and communist organizations in the United States, and Soviet espionage during the 1940s through 1960s. However, the majority of American socialist and communist organizations were never mentioned in Venona messages and bore no connection to Soviet espionage efforts. In 1995, the National Security Agency officially acknowledged the existence of the Venona Project and began the process of declassifying related documents. 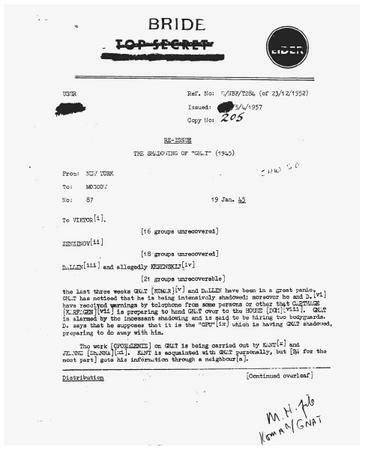 The declassified materials include project plans and specifications, case files, and copies of the decoded Soviet intercepts. Haynes, John E., and Harvey Klehr. VENONA: Decoding Soviet Espionage in America. New Haven, CT: Yale University Press, 1999. Hatch, David A. "VENONA: An Overview." American Intelligence Journal 17, no. 1/2 (1996): 71–77. United States National Security Agency. VENONA Project Declassified Documents. < http://www.nsa.gov/docs/Venona > 2003.